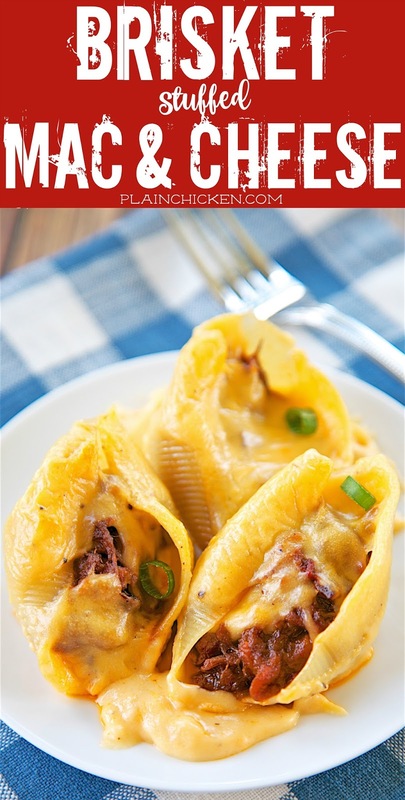 Brisket Stuffed Mac and Cheese - CRAZY good! 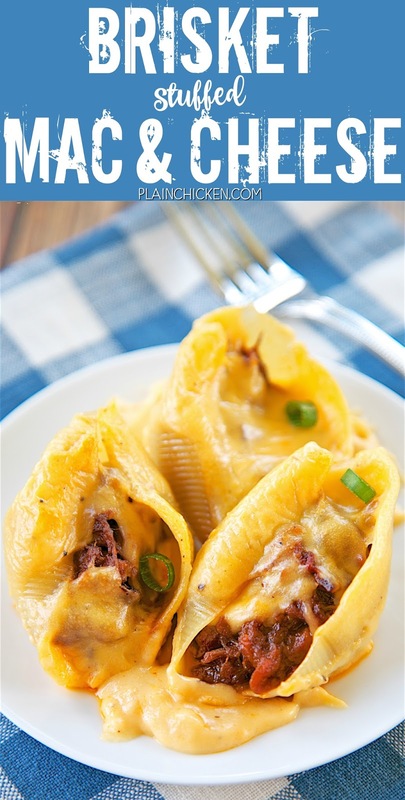 Jumbo pasta shells stuffed with Farm Rich Smokehouse Pulled Beef Brisket and topped with a quick homemade cheese sauce (butter, flour, milk and cheese). Everyone cleaned their plate! Ready in under 30 minutes! We made it twice in one week! SO good! We are smack dab in the middle of summer. Did you know that there are 99 days between Memorial Day and Labor Day? That means we have 99 days to celebrate with BBQ this summer! Woohoo! 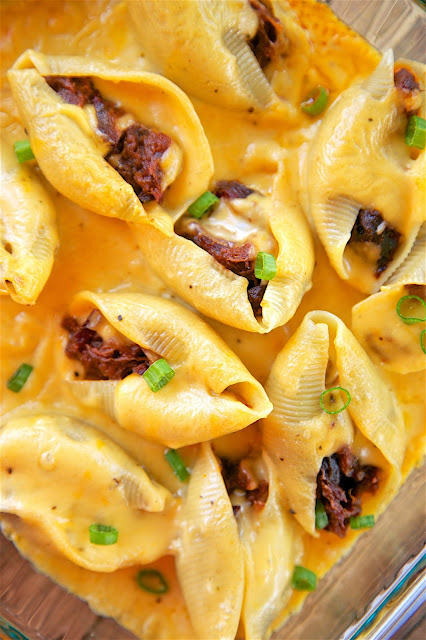 Today we are celebrating summer with this Brisket Stuffed Mac and Cheese. 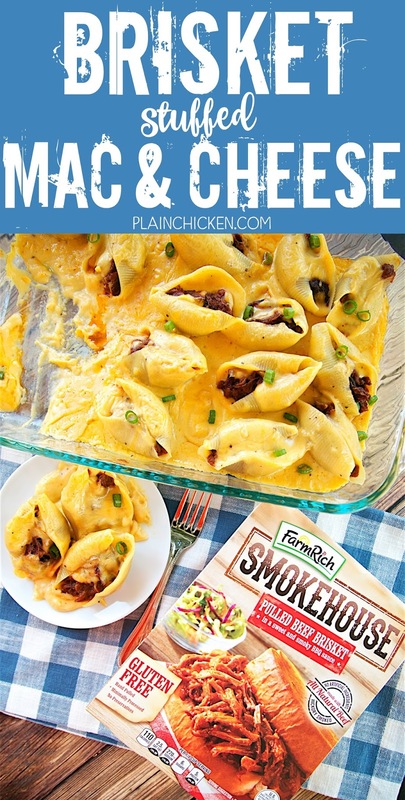 This casserole is so easy and CRAZY good! CRAZY good!! 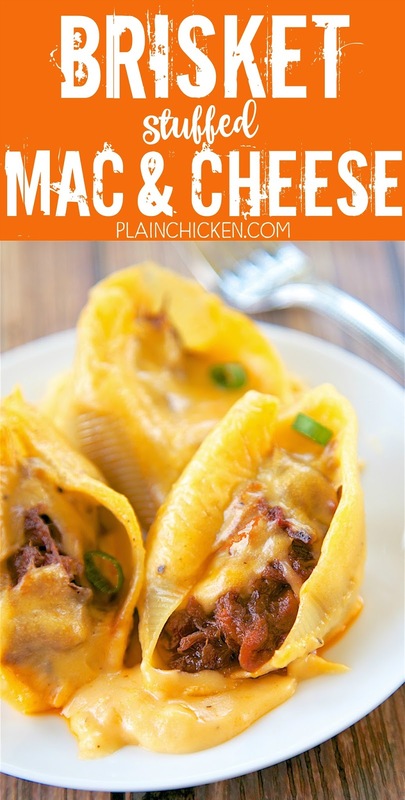 Pasta, beef, BBQ sauce and cheese - how could it be bad?!? The best part is that it only takes a few minutes to make and is on the table in under 30 minutes. For the brisket, I used a package of Farm Rich Smokehouse Pulled Beef Brisket. I found the brisket in the freezer section at Publix. It is a great shortcut! Not only does it taste delicious, there are no artificial ingredients and it is gluten-free! Win! Win! I am going to be honest. I was skeptical about using frozen grocery store brisket. I mean, how good could frozen BBQ actually taste? Well, it tasted really, really good. As good any BBQ joint! I now know why Farm Rich Smokehouse BBQ is one of the most popular ready to eat BBQ lines in the grocery store. You can really tell that the BBQ is high quality beef that has been wood smoked for 8 to 10 hours. I followed the directions for cooking the Pulled Beef Brisket in the microwave. It took 6 minutes! SIX minutes! I love that we can now have great tasting real BBQ any day of the week. I will definitely be buying the Farm Rich Smokehouse Pulled Beef Brisket again. 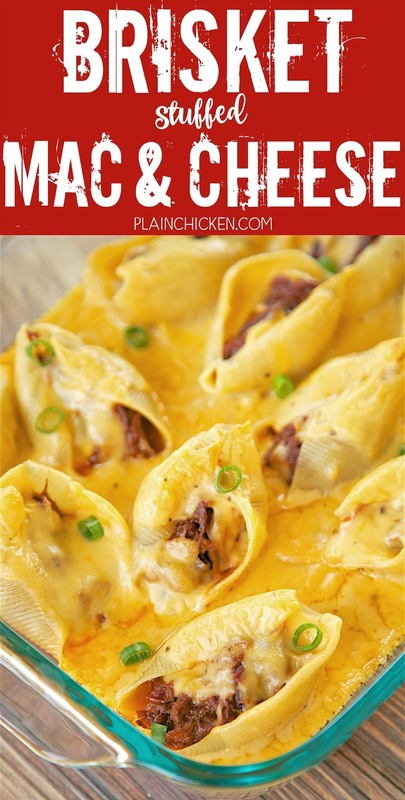 It would be fantastic for tailgating this fall! 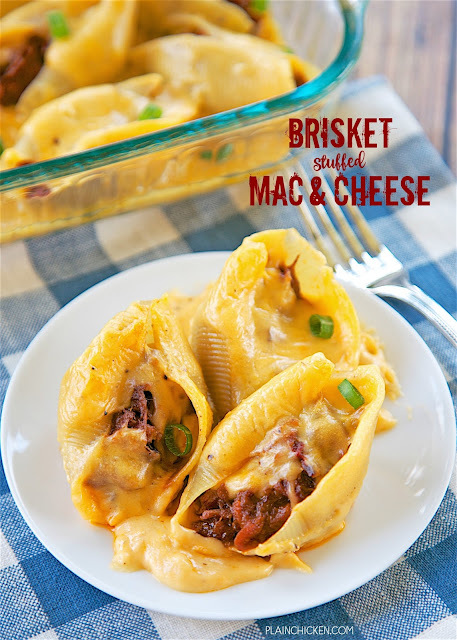 Back to the Brisket Stuffed Mac and Cheese. It was a HUGE hit! I have actually made this several times over the past few weeks. We just can't seem to get enough of it. The sweetness from the BBQ sauce combined with the yummy cheese sauce - heaven! 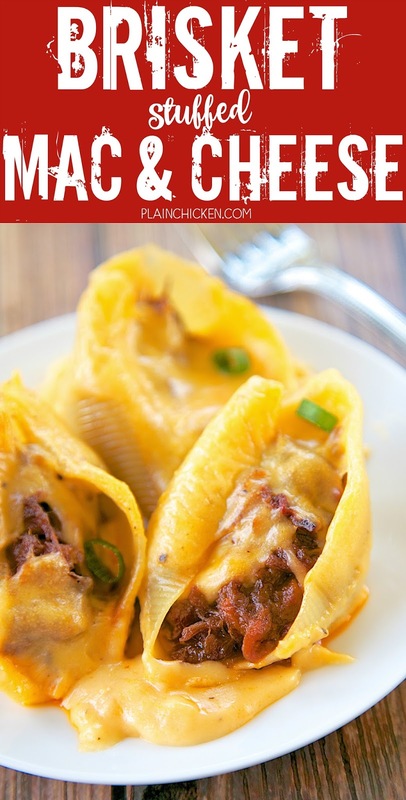 We baked these in the oven, but you could cook these in a casserole dish on the grill too!! 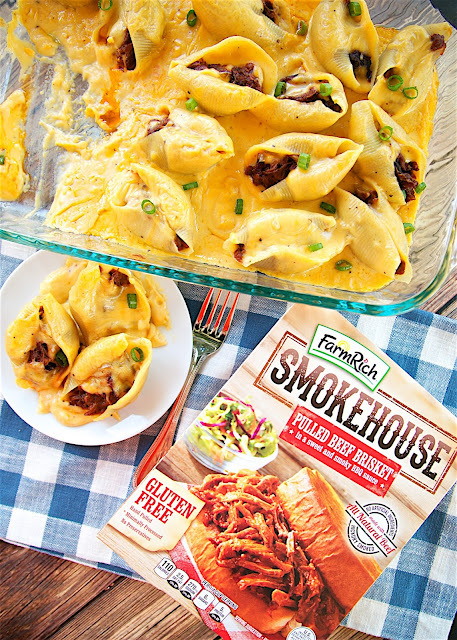 We used Pulled Beef Brisket in this recipe, but you could also use the Farm Rich Smokehouse Pulled Pork BBQ, Pulled Chicken BBQ, Dry Rub Smoked Pork or Mustard Pork BBQ. All of them would be delicious in this dish. 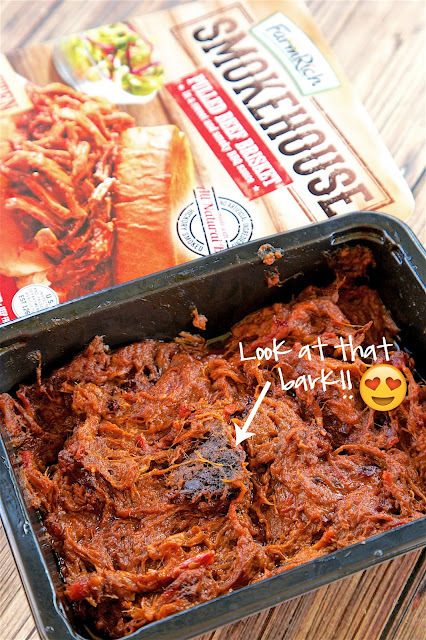 Prepare Farm Rich Smokehouse Pulled Beef Brisket according to microwave directions. Let cool for 2 or 3 minutes before handling. In a medium saucepan over medium-high heat, melt butter. Whisk in flour and cook for 1 to 2 minutes. Slowly whisk in milk. Cook for about 5 minutes, until thickened. Remove from heat and whisk in mustard, Worcestershire, salt, pepper and cheese. Stir until cheese is melted. 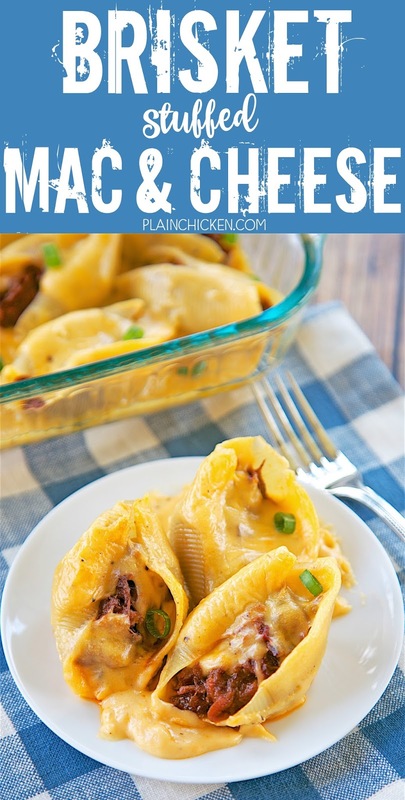 Pour cheese sauce over stuffed pasta shells. This is a sponsored conversation written by me on behalf of Farm Rich Smokehouse. The opinions and text are all mine. This is basically my dream meal. LOVE that you made mac and cheese with those big ol' shells! Stuffing them with brisket is a special kind of genius. Can this be frozen and eaten at a later date? This is pure genius. It's going on my meal plan next week for sure! !